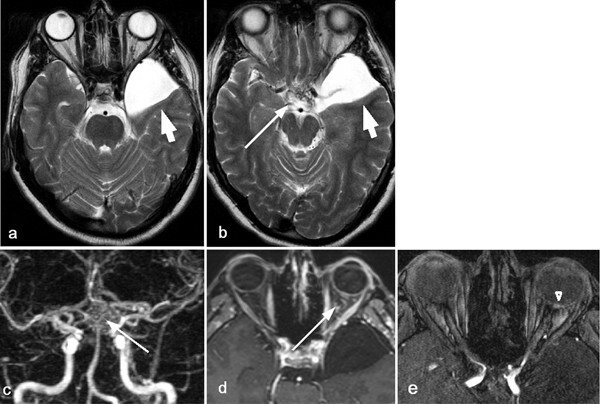 Follow-up of vascular changes in a patient with congenital retinocephalofacial vascular malformation syndrome. In a 36-year-old man, magnetic resonance im aging of the skull and cerebral angiography revealed left intracranial arteriovenous malformations. Follow-up observation of 27 years revealed no essential change of retinal and cerebral arteriovenous malformations. Additional congenital deficits in this patient were described. Patients with retinal arteriovenous malformations should be early examined with neuroradiological methods. The "congenital retinocephalofacial vascular malformation syndrome" ("CRC syndrome") is a sporadic disorder. This syndrome is defined by unilateral retinal, cerebral arteriovenous malformations (AVMs), and vascular facial skin lesions. Bonnet, Dechaume and Blanc (1937) published this triad in two patients. Wyburn-Mason (1943) described the malformation of the eye, brain, and face as an entity. This combination of vascular malformations is therefore refered to as Bonnet-Dechaume-Blanc syndrome or Wyburn-Mason syndrome. We prefer to call this special form "congenital retinocephalofacial vascular malformation syndrome" ("CRC syndrome") (Schmidt et al. 2008). Bhattacharya et al. (2001) described 15 patients with different location of AVMs, mainly in the orbit, retina, and brain which they called arteriovenous metameric syndromes (CAMS), however only one of the 15 patients revealed the typical features of a CRC-syndrome. AVMs represent rare vascular changes in which a direct connection of major arterial and venous vessels without interposition of capillaries may lead to various complications such as thrombosis and vessel occlusion. AVMs are considered to be high-flow systems (Mansour et al. 1989). In the following case report of a man with long follow-up observation, no complication of AVMs occurred. A 36-year-old man was examined over 27 years after the diagnosis of a congenital retinocephalofacial vascular malformation syndrome (CRC syndrome) was made. At the age of nine years unilateral retinal vascular abnormalities were initially observed. At the age of 13 years, CT scan revealed an arachnoidal cyst of the left temporal side in association with partial aplasia of the temporal lobe. The pediatric examination at this time showed no involvement of other organs. During the following 27 years, no ocular or neurologic deficits were observed. At the age of 32 years, the patient complained of occasional headache and sought our advice. He never complained about visual disturbances. At each examination, visual acuity was 20/20 in both eyes (last examination in October 2008). Myopia in the right eye increased during follow-up observation. In 1985 visual acuity was 20/20 without correction. In 2004 right eye correction was -2.25 dpt, and left eye correction was -0.50 dpt. In October 2008 the correction in the right eye was -3.75 dpt. and in the left eye -0.50 dpt. This corresponded to the lengths of the globe, measured by echography, which was 24.1 mm right and 22.9 mm in the affected left eye. The Goldmann visual field and the Octopus visual field of the right eye showed an absolute scotoma in the temporal upper mid-peripheral field. The Octopus visual field of the left eye showed absolute scotomas mainly in the nasal, upper, and temporal field regions. The Goldmann visual field of the left eye revealed an enlarged blind spot with absolute scotomas in the temporal mid-periphery of the field. The eye pressure was normal in both eyes. Examination of the left fundus revealed abnormal number of malformed vessels in the entire retina (Figure 1). 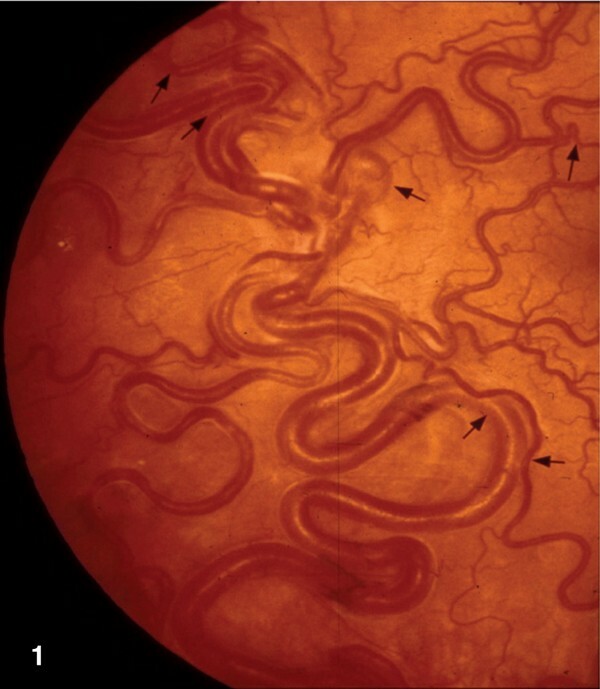 The vessels were greatly enlarged, and tangled tortuous arteries and veins could not be differentiated from each other (arteriovenous communications of the retina, AVCR). Fluorescein angiography revealed communicating shunt vessels between arterioles and venules without interposition of capillaries. An early filling of retinal vessels was obvious; the dye had disappeared within two minutes. The vessels were slightly more dilated and tortuous than 27 years before. The fundus of the right eye only revealed a slight tortuosity of perimacular arterioles. Fundus picture of left eye with extended AVMs of the whole retina. The small arrows mean a slight increase of vascular loops during follow-up after 23 years. Magnetic resonance imaging of the skull (MRI) and cerebral angiography (digital subtraction angiogra-phy/DSA) revealed an AVM in the left region of the optic nerve, chiasm, and hypothalamus (Figure 2). The nidus was composed of a typical arteriovenous network of vessels of varying caliber. Enlarged feeding arterial vessels were visible on both MRI and transfemoral angiography. The AVM drained partly into the pterygoid plexus, mainly, however, into the vein of Galen. Neither surgical treatment nor radiosurgery or endovascular treatment were recommended. 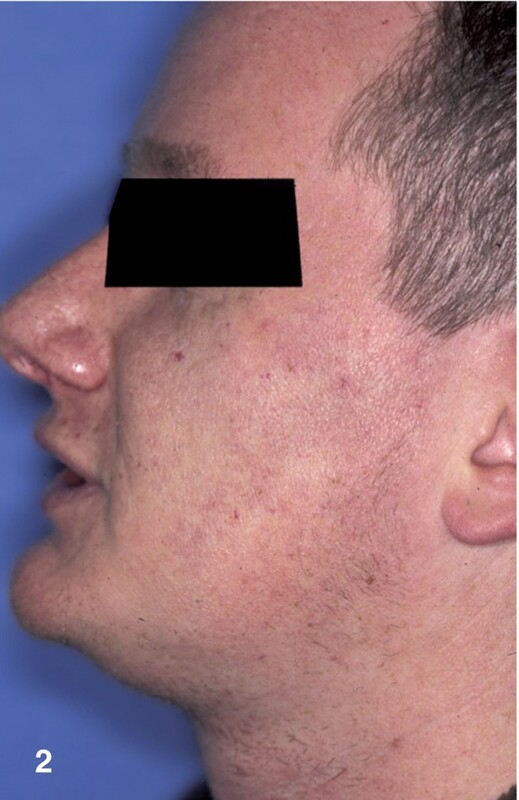 A left-sided angioma of the cheek was present (Figure 2). Left-sided angioma of the cheek (telangiectasis) of a 32-year-old man with Bonnet-Dechaume-Blanc syndrome. Apart from the AVCR, the patient presented with additional congenital deficits. At the age of 28 years, an atrial septum defect was detected by echocardiography. He also suffered from reflux esophagitis caused by a hiatal hernia („plus disease"). The left side of his face and also the mucous membrane of the cheek showed slight vascular changes appearing with a bluish colour. After a dental procedure on the affected side, the patient experienced an unusual bleeding. An arachnoidal cyst of the left temporal side in association with a partial aplasia of the temporal lobe was observed by CT examination (Figure 3). MRI showing a temporal arachnoidal cyst (short arrow in a, b), the enlarged retrobulbar vessels (long arrow in d), and retinal AVM (arrow head in e). MR-angiography in coronal view showing the chiasmal and hypothalamic network of the arterio-venous nidus (long arrow in c). The above described patient showed the characteristic triad with unilateral AVCR, AVMs of the brain, and vascular malformation of one side of the face. Digital subtraction angiography (DSA) of the left internal carotid artery: arterial phase (a, b) demonstrating the nidus of the arteriovenous malformation located around the chiasm (arrows) and behind the globe (arrowhead). In c venous drainage of the arteriovenous malformation and chorioretinal blush (open arrow). At the age of nine years retinal AVMs of the left eye were observed for the first time in our patient. Follow-up observation from his 9th to his 36th year of age revealed no essential change of retinal and cerebral AVMs. In four patients systemic features associated to a CRC syndrome were described ib the literature: only one kidney (Wyburn-Mason 1943, case 7), retardation of growth in left side of the body (von Winning 1976, case 1), and subcutaneous vascular malformation in the occipital area (Picard et al. 1973). Follow-up observation of 27 years in our patient revealed no essential change of retinal and cerebral arteriovenous malformations. Although this is the longest follow-up observation of a patient with this rare syndrome described in the literature. Deterioration can develop in all patients with cerebral AVMs, particularly if the nidus increases in size. Known cerebral complications include cranial nerve palsies, hemianopia, hemiparesis, convulsions, intracerebral or subarachnoidal hemorrhage (SAH). Archer et al. (1973) reported on severe epistaxis and bleeding from the gums due to vascular changes in the cheek, maxilla, and zygoma when the patient was 14 years old. At the age of 23 years, SAH occurred due to large AVMs in suprasellar area. Cameron (1958) reported on retinal AVMs for about 14 years in the right blind eye of a 23-year-old woman. At the age of 16, paresis of the left arm and hand developed. Spontaneous regression of cerebral AVM is extremely unusual but has been observed in single cases. Brodsky and Hoyt (2002), described spontaneous involution of retinal and intracranial AVMs in a 32-year-old man. The lack of hypertrophy in draining venous channels, together with the regional edema, suggested a recent obstruction of vascular flow within the vascular malformation.